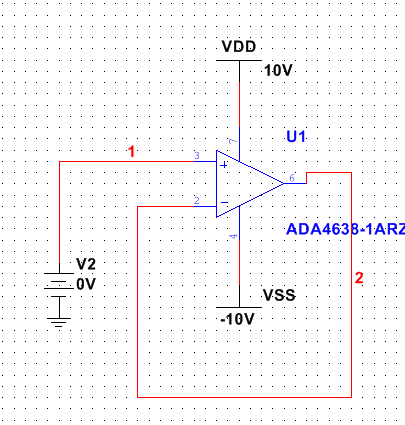 I simulated the ada4638-1 in multisim and just a simple unit gain buffer connection. But the simulation result shows the offset voltage is as high as 126 uV when supply voltage is +-10V, which is quite different to the data sheet. Can anyone help me to solve it? thanks a lot! It do works for +/-15V. But is there any method I can simulate the true offset voltage at +-10 V supply? have the PSRR spec which will change the Vos when you change Vsy. No. The model was written for +-15V, and no provisions were made for other supply voltages. So do all your sims with +/-15V on the op amp, and +/-10V on the rest of your system. I'll email the product line apps engineer.